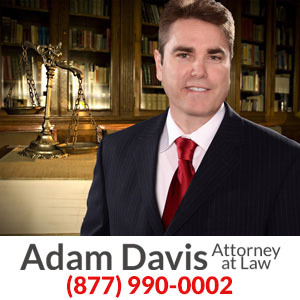 I am Adam Davis, an attorney dedicated to aggressive and assertive personal injury representation for every client. In my cases, I focus on individualized attention and service that addresses the immediate and future needs of every client and their family. From your initial consultation through the final resolution of your case, you can expect attentive client service, the prompt return of phone calls, and assistance to ensure that all of your questions and concerns are addressed. My practice was founded on the idea that a one-on-one client attorney/client relationship is critical to the success of a case. As your attorney, we will work together to effectively resolve all aspects of your case. You can expect attentive, responsive, representation until your case is resolved. I graduated from California Western School of Law in San Diego, California, in 1994 with an emphasis in trial practice. Since that time I have been practicing as a personal injury and medical malpractice lawyer with a special emphasis on catastrophic cases. I currently am a member in good standing of the Arizona Trial Lawyers Association and the American Association for Justice. Throughout the legal process, I will remain available to answer any and all questions as they arise. If you are not already a client and you want a consultation regarding a potential new case, call me today at (480) 421-1000 or toll free at (877) 990-0002 for a free consultation. You can speak to me immediately about your case. Every case is handled on a contingency basis, meaning if there is no recovery, there are no fees of any kind. Contact me for a free consultation with an experienced Phoenix and Scottsdale personal injury lawyer.